Growing up in Southern California and South Texas my mom always made tacos for dinner – lightly fried corn tortillas with seasoned carne picada, tomato, onions, cilantro and guacamole. And if she was making tacos for dinner then mom was most certainly making her Mexican rice to go on the side. I love the smell of comino being toasted with onion and freshly ground black pepper. But now when I eat tacos I think of taquitos – tiny corn tortillas filled with savory meat. In theory they’re just like my mom’s, but they’re different. They just are. We used to have to go to Mexico to enjoy the four-inch little tacos that came half a dozen to an order. In Nuevo Progreso, Tamaulipas, they sell the tacos from carts pushed along the caliche filled streets. Others set up what you might call pick-up-and-go restaurants on street corners. Each morning they set up their cart, a few tables and chairs, and fill an ice chest with Mexican Cokes. Nowadays these tacos can be found in every Mexican restaurant in the Rio Grande Valley. And just like in Nuevo Progreso, the most difficult decision is deciding whether to have your taquitos with finely chopped fajitas, bistec or tripas. The meat choice has never mattered to me because they all taste delicious. 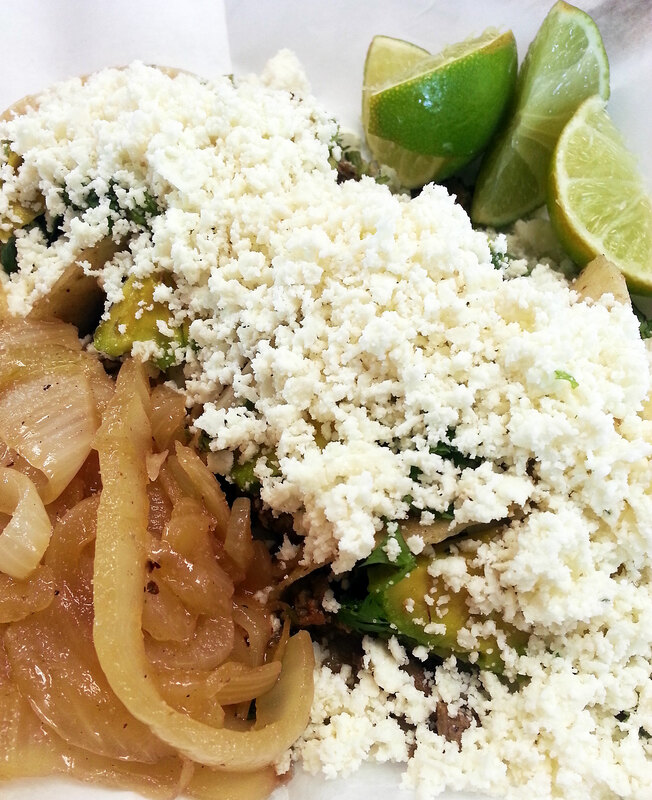 The tiny tacos are going to be covered in sauteed onions, cilantro and grated queso fresco. ← Praying to Pancho Villa?